Leslie Wayne: Recent Work represents the past five years of Wayne’s vibrant, sculptural oil paintings. The works range in size from 14 feet long to as intimate as 10 x 13 inches. Wayne states that her large works are inspired by landscape and geology and are a secular contemporary and abstract response to 19th century Romantic Landscape painting. “Rather than paint pictures of landscapes, Wayne chooses to capture the corporeal essence of nature by offering an analogous experience to being in the natural world. Alluding to compression, subduction and the shifting of tectonic plates, she packs the narrative passages into the interstices of each successive layer of paint, testing the range of Richard Serra’s famous ‘Verb List’ by pulling, scraping, folding, cutting and collaging her material like clay,” states Mark Sloan, curator of this exhibition and Director/Senior Curator at the Halsey Institute. The smaller paintings in the exhibition are part of a series entitled “One Big Love.” Wayne began these works while simultaneously working on her larger paintings in an effort to challenge herself with new parameters within a familiar and comfortable format. 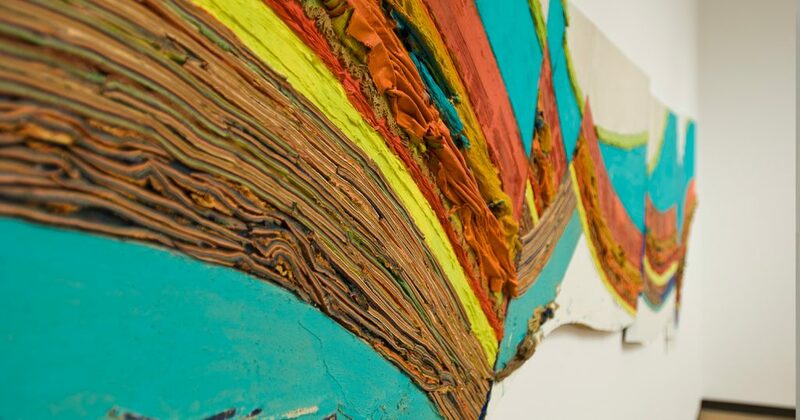 The series however now includes over fifty-five paintings, each embodying a unique world of highly manipulated, striated paint. Leslie Wayne was born in 1953 in Germany, but grew up in Southern California where she originally studied traditional oil painting and had a strong connection to the Western landscapes tradition. Her undergraduate studies began at the University of California, Santa Barbara in Painting and she finished with a BFA in Sculpture from Parsons School of Design. After her move to New York City in 1982, she abandoned observational painting and developed her signature style of intuitive painting, which is exemplified in this exhibition at the Halsey Institute. Leslie Wayne has presented her work in numerous solo and group exhibitions including the Corcoran Gallery of Art, Washington, DC; Peace Tower/Whitney Biennial, Whitney Museum of American Art, New York, NY (both 2006); Bildmuseet, Umea, Sweden; Museum of Fine Arts, St. Petersburg, FL (both 2003); The Museum of Contemporary Art, Miami, FL (2001); Santa Monica Museum of Art, Santa Monica, CA (2000); and The Continuous Painting Wall, Birmingham Museum of Art, Birmingham, AL (1999). She was the recipient of a 2006 New York Foundation for the Arts Fellowship in Painting and a past grant recipient from both the Pollock-Krasner Foundation and the Adolph and Esther Gottlieb Foundation. Leslie Wayne: Recent Work has been organized by the Halsey Institute and will travel to multiple venues around the country after making its debut in Charleston. To accompany the exhibition and give insight into Wayne’s process, the Halsey Institute has commissioned a film by John Reynolds. The Halsey has also produced a full-color catalogue with an essay by Ron Platt, Curator of Modern and Contemporary Art at the Birmingham Museum of Art. The catalogue will be for sale at the opening reception and during the exhibition at the Halsey Institute.